The Cuban Triangle: The end of El Exilio? The end of El Exilio? El exilio is not going away, either as a state of mind or as a voting bloc never forgets the pain, loss, and grievances of 1959 and its aftermath. 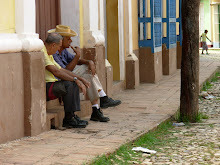 But as the Cuban-American community is increasingly populated by younger generations and immigrants who departed Cuba after the 1970’s, it is no longer defined solely by the exile experience. It is turning instead into an immigrant community with diverse outlooks and political preferences. To see that this is the case, one need only to observe the flights going to Cuba and to talk to the Cuban Americans on them. They visit and support their families, have their kids stay with their aunt in Cuba for the summer, and think of buying a family home in Cuba in a relative’s name. For them, getting on the plane is not a political act. And now, there’s a new poll from Florida International University’s Cuban Research Institute, which has been surveying Cuban American attitudes since 1991. For the first time, a majority of Cuban Americans, 52 percent, wants to end the embargo. By contrast, in the five polls conducted during the 1990's, support for the embargo averaged 85 percent. The poll shows that support for hard-line policies is concentrated in the over-65 age bracket, which means that this is a trend, not a fluke. Support for lifting the embargo is 52 percent overall: 62 percent of those 18-29, 55 percent age 30-44, 55 percent age 45-64, and 40 percent age 65 and higher. Support for re-establishing diplomatic relations is 68 percent overall: 88 percent of those 18-29, 78 percent age 30-44, 68 percent age 45-64, and 41 percent age 65 and higher. It’s no wonder that politicians – so far, only Democrats – are taking notice. Charlie Crist and Hillary Clinton are not simply questioning the policy but opposing the embargo head-on; they are, respectively, the first significant Florida statewide candidate and the first (presumptive) major Presidential candidate to do so. The electoral penalty once attached to that position no longer exists. And President Obama, the first candidate to really figure out the new Miami-Dade math, continues to think about it.